You are here: Home / Blogs / The Aruba 8400 Chassis Switch. Yes, But Why? This article is part 1 of a series on the Aruba 8400 chassis switch, launched in August 2017. See the links section at the bottom of this article for the other articles in the series. Anytime a new switch is introduced by a vendor, a common reaction from networkers is, “Who cares?” Switches are, after all, a bit tedious. Rack it up, plug in the Ethernet cables, configure some VLANs, turn up the gateway IPs, fire up the routing protocols, model in the NMS, perform a couple of speed tests, go “oooooh, ahhhhh” and then move on. Getting the power and concentration of cables to the right rack are sometimes the hardest part of such a project. When I first heard that Aruba Networks (an HPE company) would be announcing a new chassis switch, my initial reaction was neutral. Another chassis switch in a market crammed with chassis switches? Let me guess–line cards, midplanes, power supplies, fabric cards, and so on. No doubt it would move a lot of packets very quickly via a late model chipset. What would there be to get excited about? I attended the Aruba 8400 chassis switch launch day at Aruba’s shiny new briefing center in Silicon Valley on August 9, 2017. Not long after the day began, Aruba’s enthusiasm seemed reasonable to me. By the end of the day, my skepticism had turned into a series of thought exercises, as I pondered just how I might leverage the capabilities of the 8400, if I were upgrading a campus network. If you’re considering the news of a new chassis switch with little interest, you might say that on the one hand the 8400 is yet another chassis switch in a crowded field. However, you should also consider that on the other hand, the 8400 is about much more than connection density and throughput. 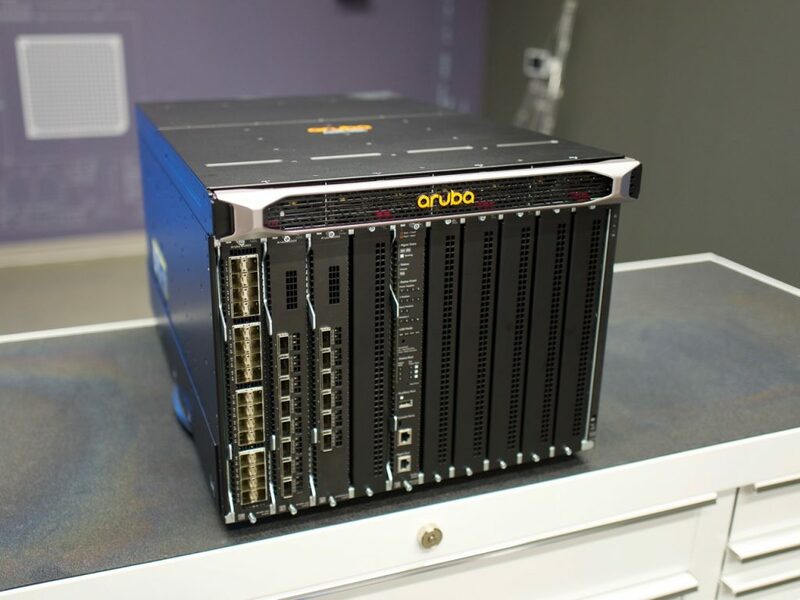 I believe that from Aruba’s perspective, the speeds and feeds are perhaps the least interesting aspects of this chassis. Why Did Aruba Make The 8400? If the 8400 isn’t to be praised exclusively for its raw performance, then what is interesting about it? Why did Aruba build this beast? Many of the new chassis switches that have gotten press at Packet Pushers are aimed at the data center. That is, new chassis switches are often destined to be a part of a leaf-spine topology, usually as a high port density spine that can be expanded with new line cards over time. That is not the 8400’s role. The 8400 is aimed at the campus core. I’ve reviewed so many data center switches in recent years that running into a clean-sheet campus switch design grabbed my interest. I’ve spent a considerable number of my engineering cycles over the years on campus network designs, and their needs have become decidedly more complex than mere connectivity in recent years. While the campus needs speed, capacity, and quality of service, it also needs strong security and smarter analytics. The analytics comes into play because the applications they connect to campus users aren’t where they used to be. A campus design used to focus on backhauling the end users’ requests to one or more data centers where nearly all applications were housed. While the centrally located data center or colo facility is still common, increasingly, applications are housed away from the campus in the public cloud. Determining the root cause of an application slowdown is more challenging, as the applications themselves can be complex, multi-layered affairs, with different components running in different locations. With the campus core switch passing much of the back-and-forth traffic between local campus clients and remote applications, it is well-positioned to gather useful telemetry. Therefore, the 8400 is about bandwidth, of course, but also about mining the data from the network and using it to improve how a business functions. Practically speaking, the 8400’s built-in data analytics platform consists of rules-based live streaming of data. That data is both detailed and and available to any process that subscribes. In other words, the 8400 can be told what data to send where–a pub/sub architecture. From a certain point of view, what Aruba has done with the 8400 is roll a visibility fabric (what Ixia, Big Switch Networks, or Gigamon can provide) into the core network product set. No, it isn’t meant to be a full visibility fabric switch. That’s not the point. Rather, the big idea is to perform all of the common analytics tasks, using the 80/20 rule, into one platform. This means that some shops might be able to do away with span ports or taps to mirror entire links to a visibility fabric which then forwards to tools for analysis. The 8400, by itself, might be enough–an interesting thought. Beyond analytics and visibility, Aruba made the 8400 to support those shops needing an API that’s as capable as the CLI. As automation of provisioning tasks via scripts and integration with orchestration platforms becomes more common, the programmability of a network switch becomes a crucial feature. Full programmability means that all aspects of the 8400 are programmable, as intended from the outset. If an application developer wants to build a full management platform customized to her business, she can. If some coder with a clever idea wants to create a software defined networking application to program the 8400’s forwarding tables, he can. The 8400 is a clean-sheet design that reportedly took just a couple of years to bring from concept to product. Considering that, I’m not surprised that Aruba prioritized an operating system with a solid, well-documented API. Savvy network engineers have been asking increasingly more of network vendors when it comes to the APIs they offer. So keen is the networking community for network programmability, that projects like NAPALM have taken off recently, attempting to make up for the deficiencies in vendor API offerings. Aruba’s made certain that the 8400 gives engineers the ability to interact however they need. In the rest of this series about the Aruba 8400, I’ll provide an overview the 8400 hardware platform as well as the operating system architecture. I’ll conclude the series with a more detailed look at the 8400’s integrated network analytics and automated root cause analysis.